"Economists put decimal points in their forecast to show they have a sense of humor"
Economics is seldom an exact science. Forecasting trade dynamics amid the uncertainty introduced by tariffs is already like flying through fog. When visibility is low, pilots have to trust their gauges. But as the government shutdown drags on, a number of economic indicators which rely on government funding are not being published, so we are without all our usual instruments. In this report, we attempt to estimate how the U.S. economy is faring in terms of international trade by checking the available, and sometimes alternative, measures. In short, we find that robust consumer spending toward the end of 2018 is likely to result in a yearend surge in retail sales. 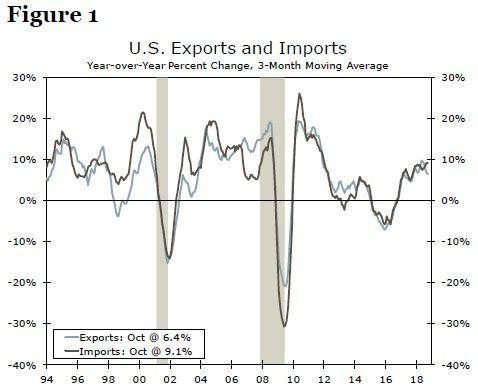 This solid domestic demand will likely lift imports faster than exports, which remain beset by retaliatory tariffs and slower global growth. Although the implementation of tariffs actually began with the softwood lumber tariffs in late 2017, they did not really get underway in earnest until the rollout of the steel and aluminum tariffs in June 2018 and the broader $200 billion tariffs directed against China last September. One effect of these tariffs was an initial surge in goods leaving the country as U.S. exporters rushed to get their goods to foreign markets before expected retaliatory tariffs began to bite. 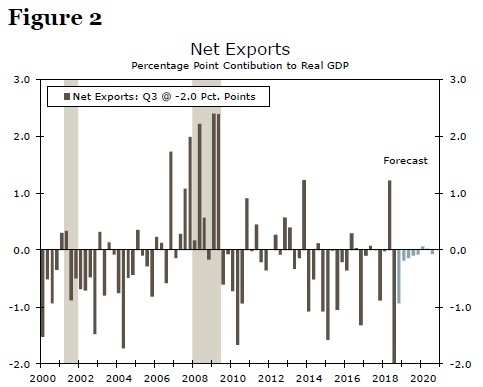 That proved to be only a temporary boost, however, as exports fell in four of the past five months for which we have data, even as imports increased every month throughout this period (Figure 1). In terms of GDP impact, the result of this was a 1.2 percentage point boost to growth in the second quarter, followed by a 2.0 percentage point drag in the third quarter (Figure 2).